When I found this recipe in the latest issue of Rachael Ray's magazine, I didn't see what made it "TOAST"achos instead of a loaded tostada. After trying the recipe, I still don't. It wasn't a bad recipe. But it wasn't "ohhh wow this is so good and unique." What makes this look a little fancier is that you take the corn tortillas and fry them yourself instead of buying premade tostada shells. This is a money saving option, but not one that I think is a real deal breaker. Save yourself some time and buy the premade shells if you can find them. I also didn't make the cheese sauce as directed. We had quite a bit of rotel cheese dip leftover from the Super Bowl party. I wasn't making cheese sauce when I had fake cheez sauce already. The kids were really "meh" about this recipe. I mean, they love tacos but for whatever reason flat tacos just didn't work for them. But gosh, doesn't it look so pretty? Fry corn tortilla in oil. Brown ground beef and added my own homemade taco seasoning. Added two cans of tomato sauce (instead of a can of paste and beef stock). 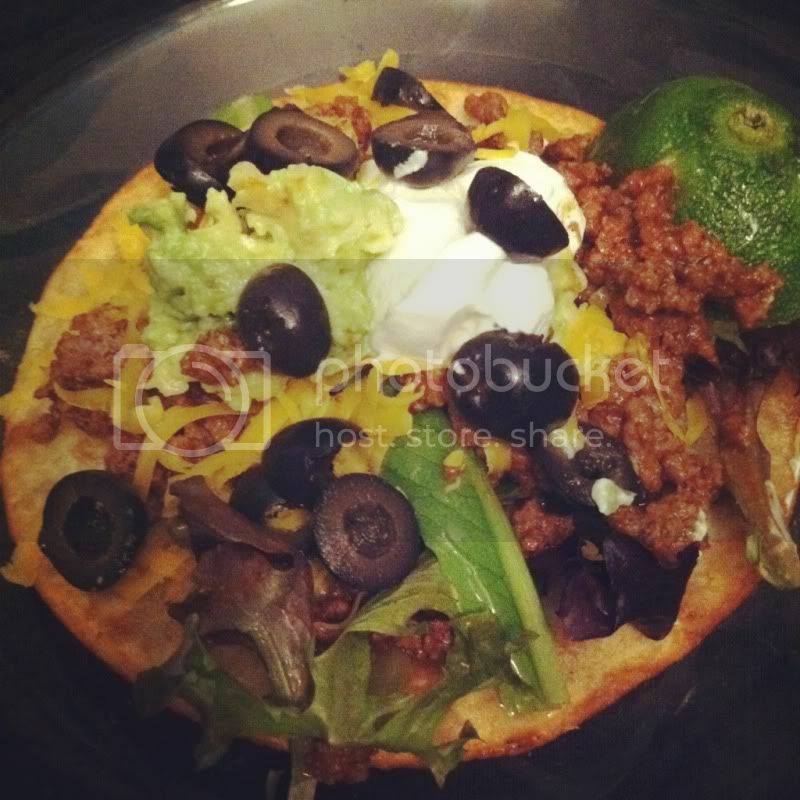 Topped with baby greens (the recipe really needed more green veggies), ground beef mixture, cheese, avocado, sour cream and black olives. We probably won't have this recipe again. It just wasn't big enough of a hit to make it in to the regular rotation;. It's too bad because I really wanted to love it.